Rain gardens are sunken garden beds that absorb stormwater runoff from hard surfaces like rooftops, sidewalks, and/or driveways. They are planted with hardy native perennial plants that take up pollutants and provide low-maintenance beauty and wildlife habitat. Rain gardens reduce the amount of runoff and pollution that enter our streams, and maintain the natural hydrology (the movement and distribution of water in the area, as it would be under natural conditions) so our landscapes stay resilient to drought and streams don’t go dry during the hot summer months. 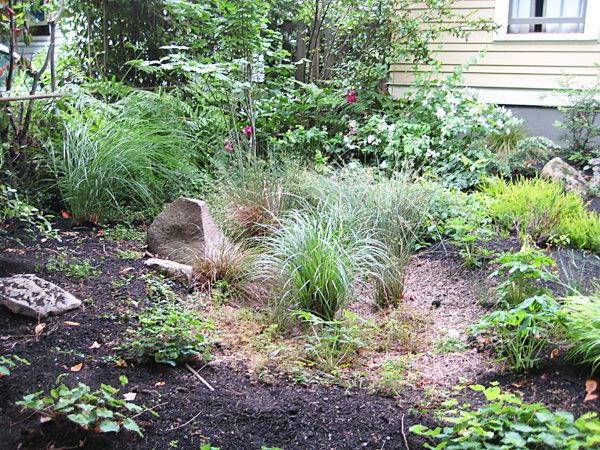 Want to manage stormwater by building a rain garden? You may be eligible for CLIP funding! Rain gardens come in many different forms and sizes! 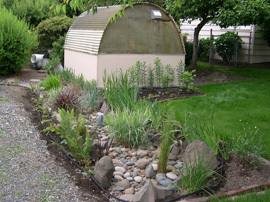 Check out our rain garden gallery pages to see some local examples. Whenever it rains, the water has to go somewhere. In natural landscapes, plants absorb some and the rest filters into the soil. This process cleans the rain and recharges our groundwater. Rain that falls on hard surfaces can’t soak in, though. Instead, it flows down our roofs, driveways, sidewalks, and streets, and into our storm sewers, picking up pollutants such as herbicides, pesticides, fertilizers, road salt, car fluids, brake dust, etc. along the way. Water treatment plants receive some (but not all) stormwater, and treat some (but not all) pollutants. Some runoff doesn’t get treated at all and goes directly into streams, where high flows during storms also cause erosion and sediment pollution. When you build a rain garden, you catch and soak up rainfall before it ever gets to a storm sewer. This reduces stormwater volume and treatment costs, keeps our waterways clean for wildlife and recreation, and recharges our groundwater. You also create a beautiful, low-maintenance, drought-tolerant landscape feature that is healthy for kids and wildlife alike. 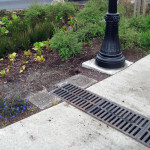 See our gallery of alternative types of stormwater-managing features. While rain gardens work for many different yards, not all yards are suitable for one! The roof area running into the downspout, how fast your soil drains, and the amount of unpaved area are all factors to consider. One good alternative for small yards is to build a stormwater planter, which does not keep the water on site but does clean it and provide wildlife habitat. You can see other examples of stormwater-managing features in the Stormwater Alternatives gallery. See our section on Stormwater Planters! Learn more about rain gardens! Check out more resources online, and attend one of our free workshops. We also have a 40-50 min presentation on the basics of planning, designing and constructing a rain garden. Contact us if your organization would be interested in a presentation.